Drive as far toward the right side of the road as is safe and stop. When driving on a two-lane roadway or undivided highway, you must yield to an emergency vehicle using its lights and/or siren, regardless of the direction from which it is approaching. Immediately drive as near as possible to the right side of the road and stop, taking care not to stop within an intersection. Downward-facing triangular signs usually indicate that drivers should yield. Once the road is clear of traffic or pedestrians and it is safe to do so, drivers may proceed. When approaching a railroad crossing, drivers must stop within ____ of the first rail, when indicated to do so. Any driver or pedestrian approaching a railroad crossing must stop within 50 feet, but not less than 15 feet, from the nearest rail of the railroad when warning lights are flashing, crossing gates are lowered, or drivers are otherwise instructed to stop. Require longer distances to stop than smaller vehicles do. Require less time to pass on a downgrade than smaller vehicles do. Require a smaller turning radius than smaller vehicles do. 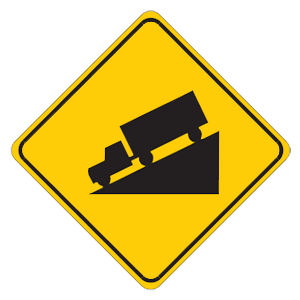 Require less time to pass on an incline than smaller vehicles do. Because of their size, trucks need longer distances to stop than smaller vehicles do.